When you get a document or contract in your inbox that you have to sign with Signaturit, you don’t need to print it. You can easily sign it online, using your smartphone, tablet or computer, quickly and efficiently. Our solution is safe, it meets the data protection laws of the European Union, and has full legal validity, not only in the EU but also in the United States. And you don't need to install any applications to use it. Open the email that contains the document or contract. In less than 30 seconds you will have signed a document with full legal validity and using a tool that meets the data protection laws of the European Union. From a smartphone and a tablet you can sign documents with your index finger. From your computer you can sign with the mouse or with your index finger, using the trackpad on your computer. You can try Signaturit free for 14 days. If you need more information about our eSignature solution call us at (+34) 935 511 480 or send us an email to marketing@signaturit.com. 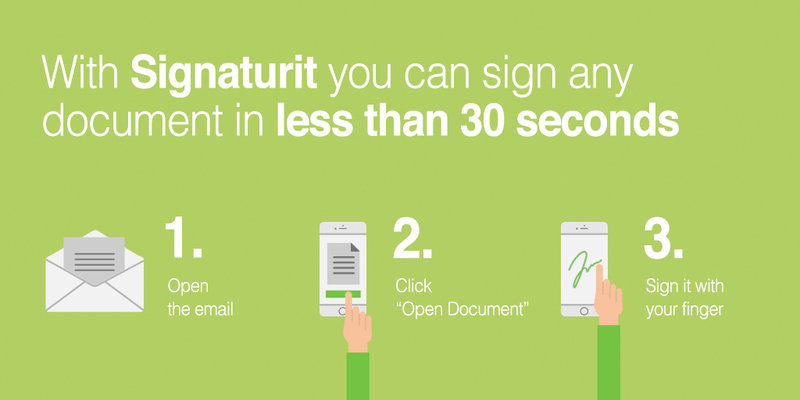 How to send a document to sign from your email account. How to use Signaturit’s advanced email features.